Your invoices, administrative documents, delivery notes, prescriptions, and contracts will be stored in no time at all with the IRIScan Express 4. 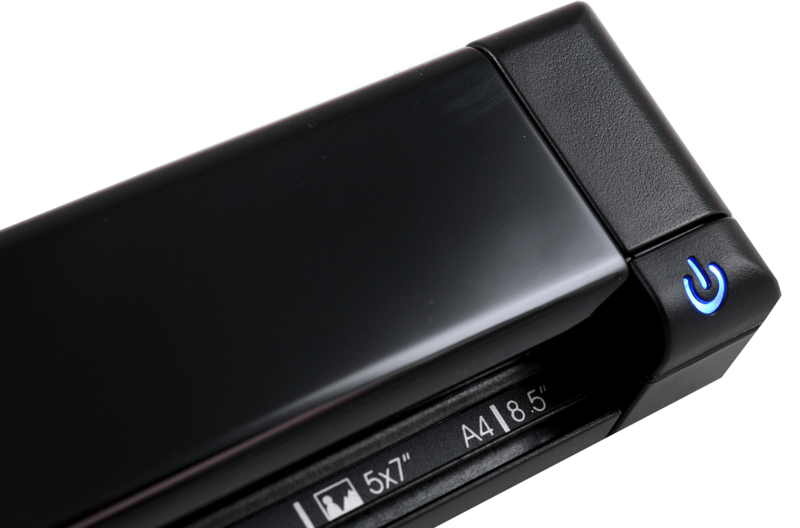 This portable USB scanner will allow you to archive all your documents in an organised and almost automatic way. Press the button and your scan is sent to the program of your choice. Storage of your documents is thus guaranteed, and they are available at any time. You can also say good-bye to filing and organisational problems! Thanks to the OCR software included in the box, you can create indexed PDFs and find your files using key words. This saves you a lot of time. People of all ages enjoy gathering to look through old family photos together. We all love to rediscover old memories, and we want them to be preserved. We also enjoy sharing them with our loved ones. Thanks to the IRIScan Express 4, you will be able to scan your family photos or your children&apos;s drawings in the blink of an eye. You can then e-mail them directly, share them on social networks, or send them directly to Google Drive. Extreme simplicity that also lets you instantaneously share your happy moments with your loved ones, even if they are thousands of miles away. No more yellowing or damaged photographs! Your memories are safe. 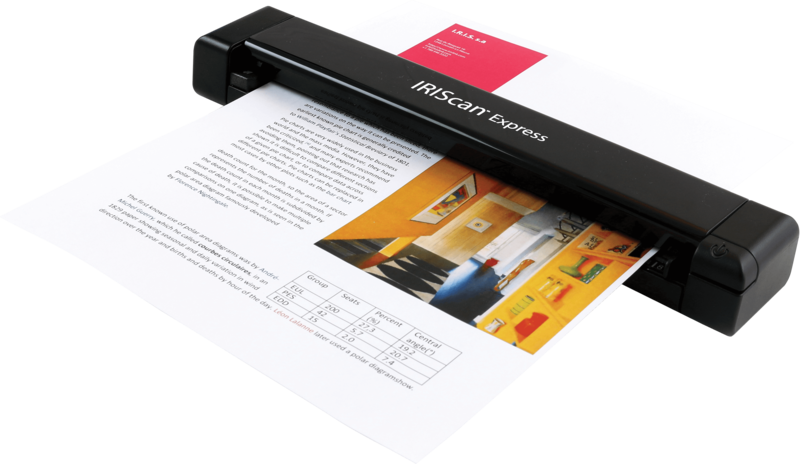 The IRIScan Express 4 is a portable USB sheetfeed scanner. So you simply need to slide the page you want to scan into the device, and it will come out scanned in a few seconds. You can scan any type of document at the rate of 8 pages per minute. Whether they are professional or private documents. You can also scan photographs or drawings. The resolution of the scanner (up to 600 DPI or 1200 DPI interpolated) guarantee you optimum quality. Different formats can also be scanned, which also makes it possible to scan identity documents or business cards. Want to scan several sheets? The IRIScan Express 4 scans pages one by one. 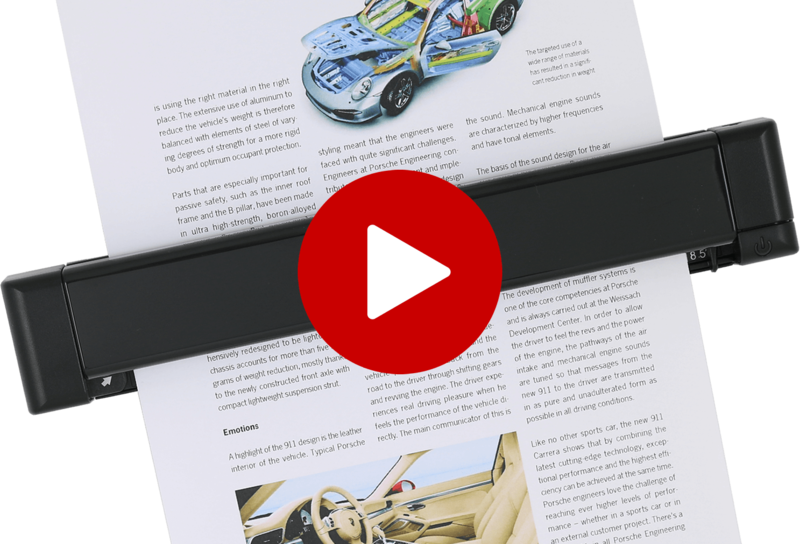 However, thanks to the OCR Readiris 16 software included with the scanner, you can easily group your PDF scans into a single PDF if you wish. But make sure you remove the staples from the documents you scan. Otherwise, they could damage the lens. 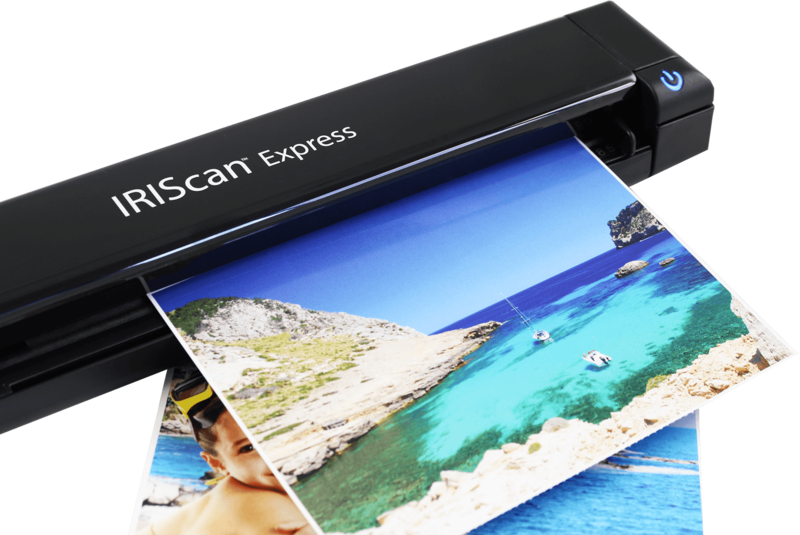 Thanks to its small size and weight (383 g), IRIScan Express 4 is your travel partner. You can easily take it with you wherever you go. To school, to work, or on a trip, It doesn&apos;t matter where, as long as you have a computer within reach. That is the main advantage of this portable USB scanner. It is the ideal partner if you need to scan documents for professional purposes, on a business trip, or just because you want to share them with colleagues. A nomadic scanner that fits easily into your suitcase or briefcase! 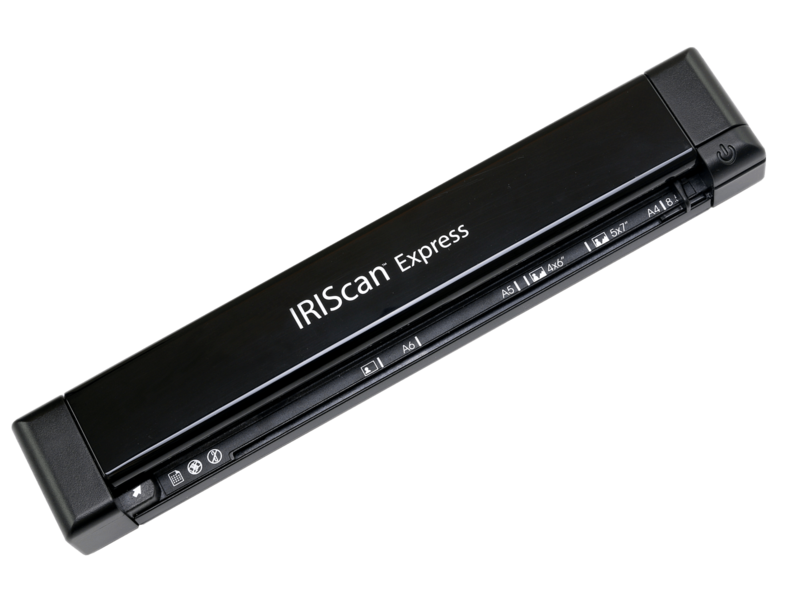 The IRIScan Express 4 is a portable USB scanner. Just connect it via USB to your PC or Mac. So you don&apos;t need batteries and no charging time is necessary. Connect it, and it&apos;s operational. No more warm-up time or waiting time when a battery is discharged. The USB socket is on the side of the scanner, so you can be sure that the cable will not get in the way when you are scanning a document. In addition, IRIScan Express 4 uses the TWAIN driver. It can therefore adapt and integrate with all types of application. 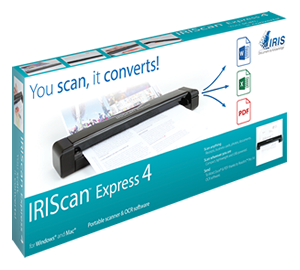 IRIScan Express 4 is equipped with a personalisable smart button, used to automate frequent scanning tasks. In one click, it lets you send the documents you scan to the program of your choice. You need to send your documents directly to the Cloud to share them with your colleagues? In one click, the scanned document is available to everyone. Are you dyslexic or visually impaired and you want to send your document directly to voice synthesis software? You can! 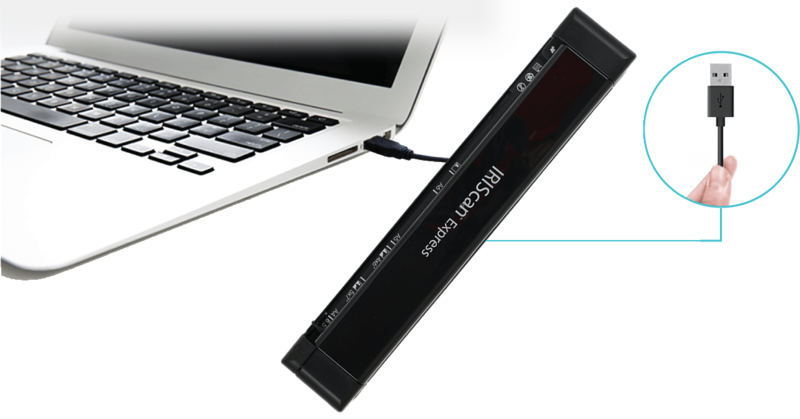 This portable USB scanner is compatible with many different programs. Save precious time, with fewer steps to perform. 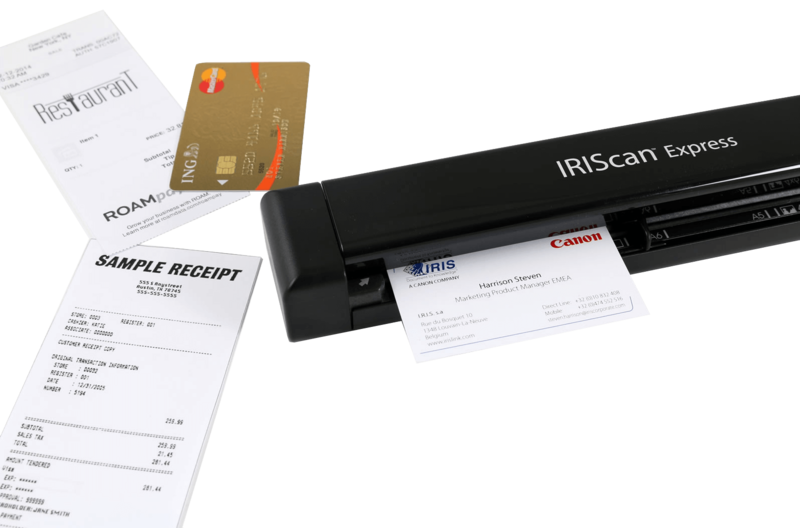 The IRIScan Express 4 is supplied with Readiris 16; an optical character recognition software (OCR) package. 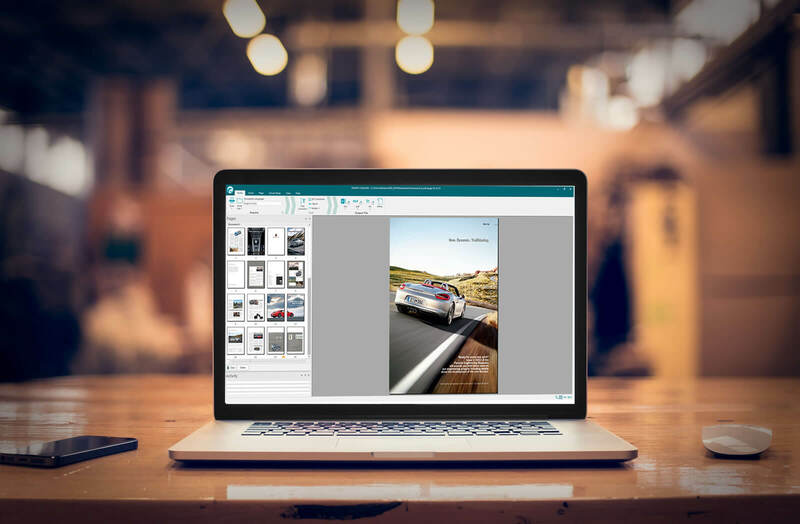 The software recognises more than 138 languages and will allow you to convert scanned documents into editable text, Word files, indexed PDFs, WAV audio file, or even an epub file compatible with most readers. You can also very easily share your documents in the Cloud via Dropbox, Evernote, Google Drive, and many others. Cardiris 5, the business card software is also included with the scanner. It lets you quickly scan cards you have been collecting for ages, or scan one directly whenever you meet a business contact at a meeting or trade show. You can then automatically extract all the data from the cards thanks to the business card recognition application supplied (Cardiris™) and export your digital contacts to Outlook, Excel, Salesforce, ACT!, etc. Cloud services handled: Evernote, Dropbox, Box and Google Drive. Thanks to the ‹ button manager › software, you can assign up to nine different functions to your scanner. With a single click, scan PDFs, Word files, or image files to the Cloud or directly into the software of your choice. Scanning receipts, business cards, photos, documents in A4/Letter format, etc. Creation of a multi-page PDF file thanks to the successive scanning of several individual pages. Unique button management, allowing up to nine different functions (Windows only). Scanning resolution: 300/600 dpi + 1200 dpi interpolated. - Maximum scanning speed: 300dpi color or black and white - 8 pages per minute. - Intel® CPU or equivalent. - Mac OS® X version 10.11 and above. - OCR software for PC and Mac® online.